The direct air link between Liverpool and New York is being suspended because of low passenger numbers. 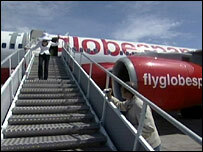 But operator FlyGlobespan say they hope to reinstate the route next summer. The service between Liverpool John Lennon airport and JFK in New York has been plagued with difficulties since it was launched in May. Now bosses at the Scotland-based airline say low numbers of passengers and technical difficulties mean they will stop the service from October. Although passenger numbers have been very disappointing, the firm said there was always a question mark over whether the flights would continue through the winter. The firm said it did not feel a transatlantic service could be sustained from Liverpool alone, so if it is re-launched next summer another city will be added to the route. The news comes less than a week after the FlyGlobespan plane was grounded in New York because of a technical problems - leaving dozens of passengers stranded and demanding compensation. Robin Tudor, from Liverpool John Lennon Airport, said: "It is frustrating, but it's not the end by any means. "The airline believes and we believe it should work and we know the demand is there. He added: "We are determined to see the route come back and that's what we'll be endeavouring to achieve."